In the Islands of Tahiti, the reefs that delight divers and snorkelers also create ideal conditions for paddlers. Lagoons formed by fringing barrier reefs are sheltered from wind and waves and filled with colorful coral gardens and sand flats where stingrays and turtles cruise. Excursions can begin right from resort beaches or the decks of over-water bungalows and lead to deserted islands or prime snorkel sites. More exciting and challenging adventures await for those who venture into passes near blue water, where blacktip sharks and big fish move with the tides. From novice to expert, there is something for all. Each of the islands of Tahiti offers prime opportunities for paddling. Higher volcanic islands such as Bora Bora and Moorea are surrounded by barrier reefs that create encircling lagoons and small satellite islands known as motus. Waters within the lagoons are sheltered from ocean swells. The low-lying atolls of Rangiroa and Fakarava offer even greater expanses of protected water, along with numerous sandbars and motus to explore. For a unique and authentic immersion in Tahitian water culture, sign up for the program known as My Polynesian Life, which begins includes instruction in the traditions of paddling and sailing outrigger canoes, along with net fishing lessons. Later, you will help turn your catch into the national dish, poisson cru. After learning the proper paddling techniques, participants can join the crew of an outrigger canoe for a tour of Moorea's coastal bays. Kayak excursions launching from Bora Bora's waterfront resorts can take in coral gardens within the lagoon and secluded beaches on uninhabited motus. The atolls of Rangiroa and Fakarava offer miles of calm water paddling. A long-sleeve lycra water shirt and a wide-brimmed hat to provide sun protection when on the water. Sports sandals or water shoes. A water bottle secured on a leash. Polarized sunglasses on a floating lanyard. A waterproof camera and carry case or dry bag for personal items. MOOREA - CARADONNA RECOMMENDS includes 6 nights Lanai Room accommodations, Moorea Quad/ATV Guided Adventure Tour from West Coast (duration 3.5 hours), Nature & Culture in Moorea - Half Day Van & Walking Tour, My Polynesian Life - Full Day (Lunch included) includes outrigger canoe paddling techniques, net fishing lesson, cooking lesson with your catch and visit Sam's Plantation, breakfast daily, roundtrip airport transfers, hotel tax and service charges. Valid 4/1/19-5/31/19, 11/1/19-12/19/19 & 1/4/20-3/31/20. Add $120 per person for travel 6/1/19-10/31/19 & 12/20/19-1/3/20. TAHITI - BUILD YOUR OWN PACKAGE includes 6 nights Standard Room accommodations, roundtrip airport transfers, hotel tax and service charges. Options to add-on Offroading Tour, Hiking in Fautaua Valley, Whale Watching and Tiger Shark Dives. MOOREA - BUILD YOUR OWN PACKAGE includes 6 nights luxury gardenview accommodations, breakfast daily, roundtrip airport transfers, hotel tax and service charges. Options to add-on Offroading Excursions, Outrigger Canoe Adventures, Walking Tour and Culture Tours. BORA BORA - BUILD YOUR OWN PACKAGE includes 6 nights Garden Bungalow accommodation, breakfast daily, roundtrip airport transfers, hotel tax, and service charges. Options to add-on Offroad Excursions, Hiking Tours, Tahitian Pearl Adventure and Kitesurf Lessons. MOOREA - InterContinental Moorea Resort & Spa is nestled between mountains and a lagoon on a stunning French Polynesian island. Right on the resort grounds is Moorea’s widest range of activities, which includes the Moorea Dolphin Center, tennis, kayaking, canoeing, skiing and Jeep tours. The Arahurahu Marae temple is also worth a visit. BORA BORA - Located at the south tip of the main island of Bora Bora, near Matira Point and its gorgeous beaches, Maitai Polynesia is nestled on a hillside overlooking the lagoon in lush tropical gardens. A variety of accommodations from well-appointed hotel rooms to some of Tahiti's most affordable overwater bungalows are available. 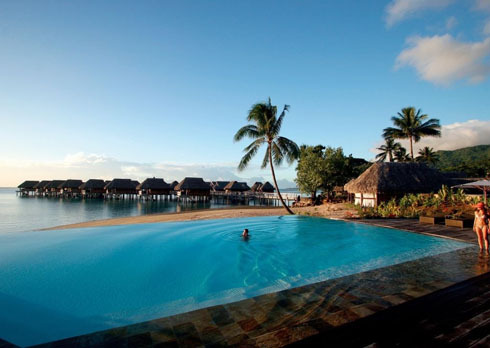 MOOREA - This luxury resort offers a wide variety of accommodations including overwater, beach and garden bungalows, all situated for maximum privacy and views. Two restaurants, a stunning infinity pool, So Spa and onsite Ia Ora Diving Center offer all of the indulgences necessary for a perfect dive escape. 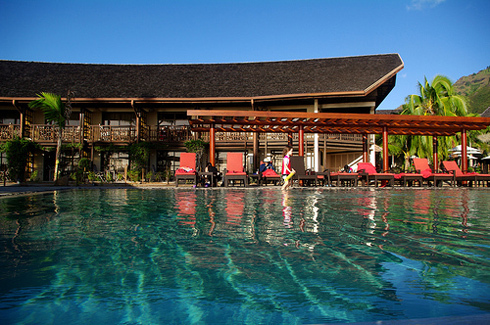 Combination packages with Sofitel resorts in Tahiti and Bora Bora are also available. A valid U.S. passport is required for entry into Tahiti which must be valid for 3 months beyond your date of entry. Your passport needs to have at least 1 blank page for the Tahiti entry stamp. Proof of return or onward ticket is required. No visas are required for tourist stays of less than 90 days. Exit Requirements: There is a departure tax of 1822 XPF approx $17 U.S. which should be included in your international ticket. No immunizations are required for entry into Tahiti, but we would always suggest that you check with your doctor and the Centers for Disease Control on recommended vaccinations for travel to Tahiti at Traveler's Health CDC. Tahiti and the Society Islands loom large in our collective images of tropical paradise. 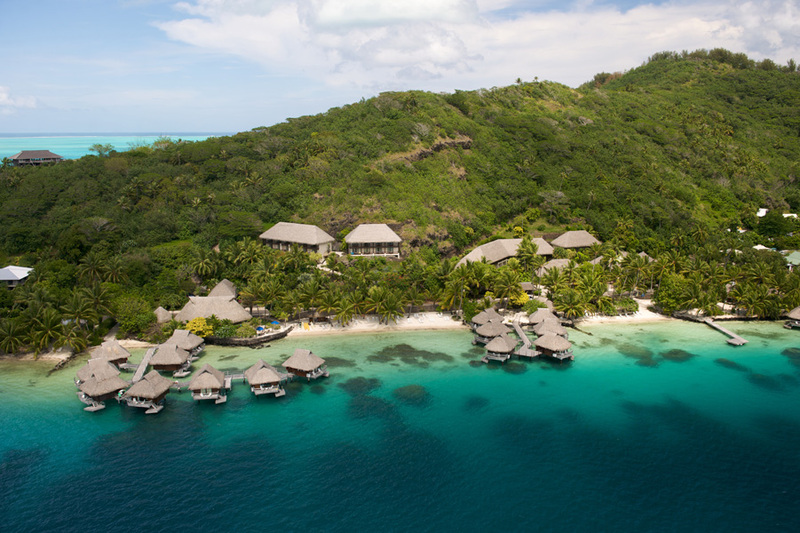 These are the islands that seduced the crew of the Bounty to mutiny, inspired the works of Gauguin and Melville, and now entice celebrities, newlyweds and dreamers to escape the every day for a thatch-roofed bungalow perched over an electric-blue lagoon. As a semi-autonomous territory of France, the islands combine Continental flair with the ancient traditions of Polynesia. Evidence of this blending begins at breakfast, where a bowl of cafe au lait and a buttery croissant are accompanied by fresh papaya, mango and breadfruit, served with a spray of tropical flowers. Tattoo is a Tahitian word, and body art is considered a sign of beauty. Dance has always played an important role in island life, with performances for everything from welcoming visitors to challenging an enemy or seducing a mate. 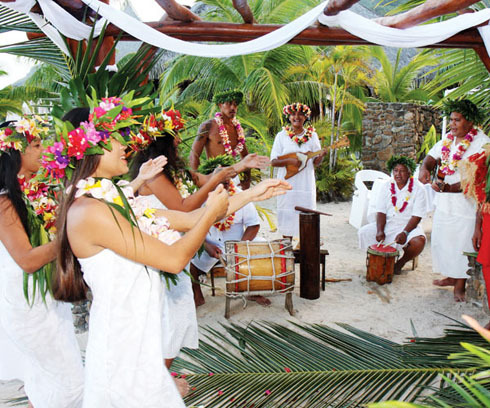 Traditions are kept alive at the annual gathering of Heiva i Tahiti, when islanders from across the archipelago gather at Papeete for celebrations that include elaborate spectacles of song and dance, along with arts and crafts fairs and traditional sporting events such as canoe races and strong man contests. A year-round staple of Tahitian culture are flowers, which grow in abundance across the islands. Bright blossoms are worn in floral crowns or as single displays behind the ears, denoting either one's availability or commitment. The same long-standing traditions of hospitality that welcomed early European explorers and subsequent generations of sailors are now lavished on arriving vacationers, who will discover not only some of the friendliest people in the world, but also some of the most seductive landscapes, where sea, sky and island come together in riotous shades of blue and green. Electricity in Tahiti is 220 Volts, 60 cycles. Hotels may use 110 or 220 Volts depending on your location, so a converter/adapter is often required for appliances you bring, including computers. Direct dialing international calling is available in most hotels. When calling from the U.S. to Tahiti, dial 011 and then the country code of 689 along with the local number. Check with your cell phone provider to see if they have an international plan that is compatible in Tahiti for voice, text and data. Internet access is available in many hotels and resorts. 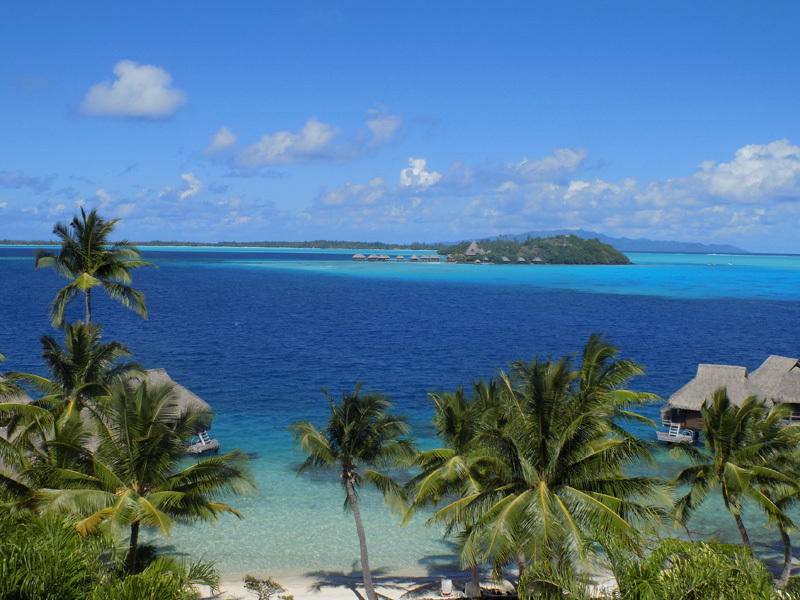 Tap water is safe to drink in Papeete and Bora Bora. Elsewhere bottled water is recommended and readily available. French and Tahitian are the official languages, but English is spoken and understood in tourist areas. The currency of Tahiti is the French Pacific Franc (XPF). Bank notes come in denominations of 500, 1000, 5000 and 10,000, and coins in denominations of 1, 2, 5, 10, 20, 50 and 100.
Credit cards are readily accepted in most tourist destinations. Most guests exchange money at the airport upon arrival or at their hotel, but the best exchange rate should be at a local bank. There are three time zones in Tahiti. The Society Islands including Papeete and Moorea and the Leeward Islands including Bora Bora, and the Tuamotu Islands including Fakarava and Rangiroa are all 10 hours behind Greenwich Mean Time (-10 GMT). The Gambier Islands are 9 hours behind Greenwich Mean Time (-9 GMT). The Marquesas Islands are 9.5 hours behind Greenwich Mean Time (-9.5 GMT). Tahiti does not use daylight savings time. Tahiti is located south of the equator halfway between California and Australia. The islands of Tahiti, known as French Polynesia, consist of 5 island groups. There are 118 islands with a total land mass of 1,544 square miles. The population of French Polynesia is 285,699 (2016).